Most days, I wear one of two pairs of identical jeans and a t-shirt crusted with cookie or miscellaneous baby goo. It's a glamorous look. I like clothing, but when I'm tempted, it's usually to purchase some miniature item for the girl. On occasion I have been tempted into spending grocery money on ill-crafted shoes that are guaranteed to give me blisters and take up space in my closet. My latest regrettable shoe purchase was made just last night. I found these little lovelies at Target and was sold. So cute! So sparkly! So painful! Friends, you are looking at two miserable feet. 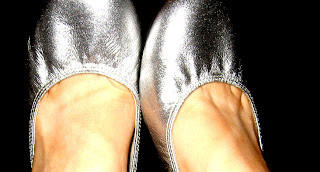 They are darn cute, and if I had taken more than 10 seconds to try them on, I would have found that these silver sparkly ballet flats didn't fit. I wore them today while Claire played at the park (ouch!). I wore them to storytime (wanting both my mommy and my flip flops). I wore them to the store (at this point I sort of tucked the heal of the shoe under my actual heal and hobbled to the check out. Again, quite a glamorous look). I have a feeling that these shoes will fit right in with tutus and tiaras and princess frocks when the girl moves on from purses full of Legos and wants to dress up all the way. Until then, I will tuck them away with my other sparkly impulse buys. Perhaps Nina Garcia could have saved me from today's pain. This is part of PBN's Little Black Book of Style Blog Blast. You can join in until midnight tonight. I like those shoes. No matter what anyone else says. They remind me of Dorothy's ruby slippers. Except in silver! I have some black ones like that - and once I wore them a few times they stretched enough to be comfortable AND cute!